I know I have been posting a lot of crockpot recipes lately. I swear once Winter comes there is something cozy about pulling out my crockpot and smelling yummy food all day while it cooks. I am usually making several meals a day, so it is nice to know something will be done just in time for dinner without me having to keep an eye on it. I don't cook much with the crockpot during the Spring and Summer months. This recipe came out perfectly. 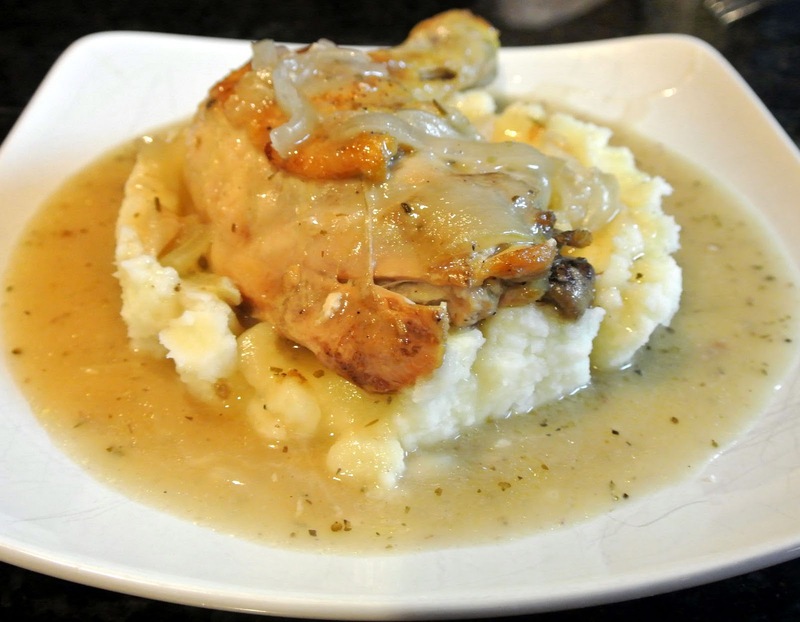 Moist tender chicken with an amazing garlic gravy that is perfect to be served with mashed potatoes. I started with a whole fryer Chicken. I found some really good Free Range Organic Chicken for $0.99 a pound! Score! In a large skillet, heat oil over medium- high heat. Cook the chicken, skin-side-down, until the skin turns golden brown (about 4 minutes). Combine the onion, garlic and thyme in a 5 to 6-quart slow cooker and season with salt and pepper. Top with chicken, skin-side-up. 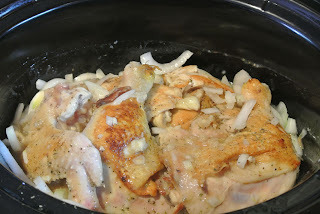 In a small bowl, whisk together wine and flour until smooth and pour it over the chicken and into the slow cooker. Cover and cook until the chicken is tender- 3 1/2 hours on HIGH or 7 hours on LOW. Serve chicken topped with sauce. Serve over mashed potatoes.